In this week’s Throwback we wind back the calendar 18 years to the year 2000. The site is Pocono International Raceway for the August Wrenchead.com National Road Race Series sanctioned by Formula USA. In the premier Lockhart-Phillips USA Unlimited Superbike class, Leg 1 came down to an intense tussle between Team Valvoline EMGO Suzuki’s John Hopkins (who was just 17 at the time) on his No. 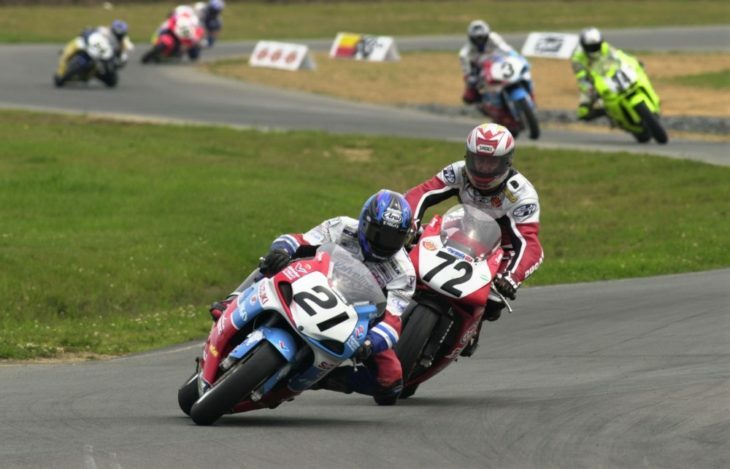 21 GSX-R750 and Larry Pegram (No. 72) aboard his Competition Accessories Ducati 996. The two swapped the lead several times late in the race. On the last lap of the 12-lap race, Pegram led when Hopkins suddenly dove inside at the end of the back straight. Pegram tried to answer but came up a little short and had to settle for second.